Tonight’s Quantico season 2 episode 14 looks like it is going to be awesome so make sure to bookmark this spot and come back between 10 PM – 11 PM ET for our Quantico recap! 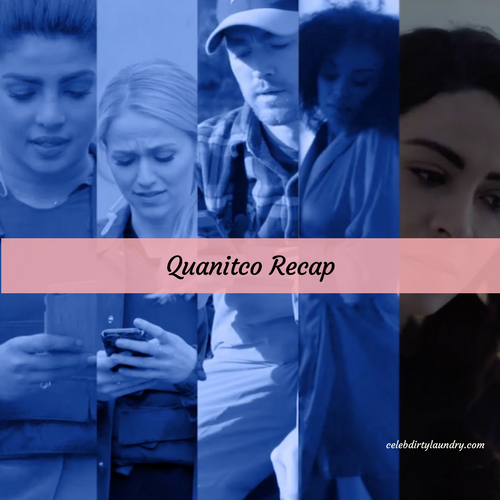 While you wait for the recap make sure to check out all our Quantico recaps, spoilers, news & more, right here! Unfortunately, a top super secret task force doesn’t come with any perks. So the federal agents all had to travel several hours just to make it to the Farm and they didn’t even get reimbursed for their gas. But the job offered them untold adventure and excitement so no one truly regretted saying yes however they didn’t know how hard it would be working for Claire Haas. Claire Haas had told them that they were pillars that held up the defense of the country and she said that if all the pillars were to collapse that it would create a perfect storm. Much like 9/11 or what recently happened at the G20 Summit. However, what Claire wanted the agents to investigate tonight may or may not lead to another perfect storm. She told the team that recently someone had hacked the government’s. The cache was data going back years about the country’s defenses yet the cache being accessed wasn’t the one thing that happened. There was also a RNX cargo plane that crashed and so what Claire as well as Keys wanted was for the team to investigate whether or not the two events were somehow connected. So she thought that everyone that had been put together for the team would be able to work together. And it turns out she was wrong. Claire’s other son Clayton or Clay as he likes to be called had had a problem with working with Shelby because she had slept with both his father and his brother. Yet, Shelby also had a problem with working with Nimah. She thought that Nimah had proven to them once already that she was capable of becoming a terrorist and so she didn’t want to trust Nimah with sensitive information though Nimah in fact had a problem with working with Dayana. Dayana had wanted to be friends or at least friendly with Nomah and Nimah had shunned her because she doesn’t want to trust someone new. So the team that was supposed to save the world had also fallen apart on Day 1. So Clay whose job it was to watch over them all and make sure that everything was coming together along, had called in for some help with his unruly bunch. He had gotten Owen Hall to come in and Owen had given the team purpose. He said if they wanted to find out who had sabotaged the plane then they needed to follow the money and it seems that Nimah had the same idea as well. She hadn’t said anything before he arrived because she was afraid to put herself forward what with Shelby’s comments all the time, but Nimah had looked into who would make a profit from the plane crash and she had found out that someone had been manipulating the stock market. Nimah had found evidence that someone used insider trading to make a profit on the crash and she said she got the idea to look it up because that’s what happened on 9/10. But Owen had had a name for everyone. He had found out that the guy that made a 112 million dollars recently was Shaun Gregory. Gregory, ran an investment group and it was his job to make rich people even richer. So the team knew that Gregory got the tip from somewhere however the guys’ job was to find the collaborators behind the actual plane crash and so they went to a party that Gregory’s group was funding. The party was apparently a bid to collect more clients and so everyone had gotten a role to play. The guys were supposed to be making a pitch to potential clients as well as to Gregory himself for cyber-security. However, some of their covers hadn’t been easy to carry out. Shelby for instance had attended the party as herself therefore she was an heiress considering her options yet some of the party-goers had remembered that Shelby joined the FBI so Clay had been forced to rescue her before he cover was blown and that didn’t mean that they were suddenly friends. Clay still didn’t like Shelby because of what she did to his family and he had made his feelings clear. Clay had told Shelby that he had taken on the job to act his mother’s top political strategist and to be her eyes on their organization because he had been promised that Shelby wouldn’t be part of the team. Yet, mother had apparently explained to him that she had no other choice. Claire had told Clay that she had to make Shelby part of what they were doing because she had bene there at the summit and knew too much. So Clay had rubbed that fact in Shelby’s face. He told her that she was surrounded by agents that were a lot better than her because she wasn’t supposed to be and, to add salt to the wound, Clay had called her deadweight. Clay didn’t believe that Shelby offered anything to the team and that she was holding them back with all of her mistakes. Though Nimah had sympathized with Shelby. She thought they shouldn’t be defined by the their biggest mistake and so she understood Shelby a lot more than Shelby wanted to admit, but their mission to investigate GIP Investments had taken an unexpected turn. Alex had later run into Harry and he had helped her cover what she was doing in the building. So Harry being around had gotten Alex thinking. Alex thought that Harry would make a great addition to the team and so she had vouched for him. Alex knew that Harry had been let go from MI6 and that he couldn’t get back into the organization unless he proved himself. But Keyes didn’t want Harry back despite what Harry and Alex found. The duo had found out the GIP weren’t terrorist and instead were running a Ponzi Scheme. So they kept digging until they came across ENGIN Industries. ENGIN was this seemingly harmless aviator start-up and it made the most money out of the crash because the cargo plane had been carrying one of a kind aviation technology that could identify where a plane would crash. And therefore they had the most motive to crashing the plane however the collaborator’s name was Christian Kelly. Kelly was one spoke on the wheel and there were still many others they needed to find. However, the team was slowly coming together towards the end. Shelby had reached out to both Nimah and Clay and they were trying to figure out how to work together without snapping at each other. So after Owen decided to finally put his trust in the team, Alex and Dayana had snuck off to meet up with Leon. Leon had said that someone was hunting all of them and he had claimed that Alex and Dayana weren’t safe either yet the women had checked out his theory and they had thought that he was just jittery. And so they dismissed Leon’s theories. And, later, Leon was kidnapped!